The planets Tareh and Earth, connected by a wormhole, share many similar plants, animals, and civilizations. However, just because something is extinct on one, does not mean it has disappeared on the other. Sam, the King’s second son, after escaping into the wilds across the mighty White River, falls ill and is unable to fend for himself. Lal, a poor girl from the village, runs away from home to avoid an arranged marriage to an old man. Drawn by the smoke from Sam’s smoldering fire, she finds him weak and near death. The two new friends set about surviving in the unforgiving wilderness. Unfortunately, young and inexperienced Human children are not equipped for life outside. Aid comes in the form of a family of Neanderthals, still in existence on Tareh, and well adapted to living in the forest. Together they discover a shared history of a time long ago, when Neanderthals helped Humans, and a King made a promise to his Neanderthal friends. Can the two learn from each other now? And can Sam fulfill the ancient promise of his family line? 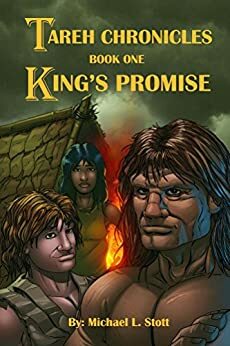 The post <p style="text-align:center;font-weight:bold;">A long time ago, when Neanderthals helped Humans, and a King made a promise to his Neanderthal friends…<br >Michael Stott’s epic fantasy <em>Tareh Chronicles: King’s Promise </em></p> appeared first on Kindle Fire on Kindle Nation Daily.